Two-Time Olympian Gold Medalist Claressa Shields returns to action on a Showtime Special Edition this Friday night. Her opponent is Hanna Gabriels, a junior middleweight with a decent amount of pro experience. Gabriels is moving up to middleweight and Claressa is coming down to the 160-pound division. Shields originally planned to fight in the spring on a ShoBox: The Next Generation card but finding a suitable opponent proved too difficult. The silver lining of not being able to secure a credible opponent in the spring allowed for a slight increase in budget, hence the special edition upgrade from Showtime. Due to a longer than expected layoff Claressa took it as a challenge to cut down to the 160, shredding over 20 pounds before and during training camp. Already a hard worker, Shields cleaned up her diet to lose the weight safely. She has also spoke of potentially fighting at 154 at some point. Claressa has taken the pro ranks by storm climbing the ladder at a rapid pace in search of greatness. Her goal is to be known as the best female fighter of all time and to put woman’s boxing on the map in America. Friday is another step towards greatness and exposure for Shields, who hopes to build on the momentum of becoming the first female to be a headliner on a premium cable network. As a professional fighter Shields is still a work in progress just 5 fights in. Her power she flashed in the amateur’s has yet to show up in the pros, however Shields punching power will be more effective at the lower weights. At times Claressa sticks to the fundamentals behind a jab, while other moments she gets baited into a brawl. 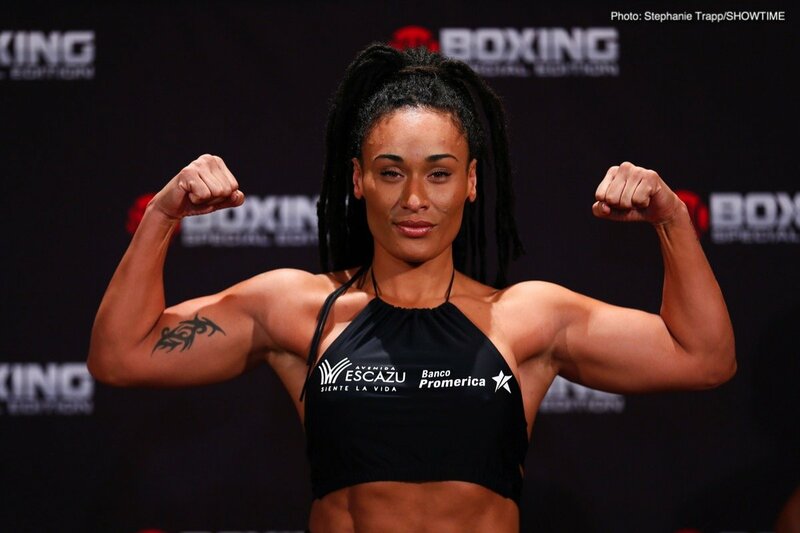 Hanna Gabriels lack of amateur fights will likely be her undoing come Friday. Gabriels best bet for victory is to keep her feet moving on the outside and a jab pumping. Hanna has been stopped before around 5 years ago, it should be noted Gabriels did avenge her only loss. All and all, this Friday night represents another opportunity to get the Flint, Michigan native more rounds as well as acclimated to the middleweight division. Pretty sure we will get a knockdown and a stoppage outcome with Shields coming out on top. The co-feature matches two-belt middleweight champion Christina Hammer with Tori Nelson. Nelson fought hard in her last outing versus Claressa Shields and is no push over. If Hammer gets past Nelson, Showtime will look to match her against Shields setting up an undisputed middleweight battle. 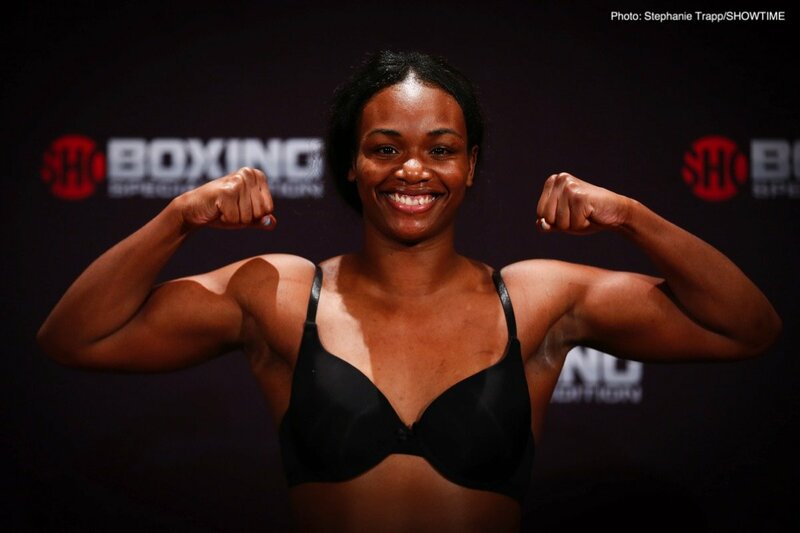 My Official Predictions: Claressa Shields via 5th round TKO and Christina Hammer by UD. Side Note: Keep an eye out for rising prospect Virgel Ortiz, who takes on a veteran in Juan Salgado on ESPN2 this Saturday night. Also, Saturday afternoon unbeaten Josh Taylor gets his biggest test as a pro facing Viktor Postol for a WBC junior welterweight title eliminator. Postol needs a win to prove his impressive win over Matthysse wasn’t a fluke while Taylor can add a quality name to his resume should he be victorious.